Prime Minister Dr. Timothy Harris announcing the national awards recipients during address on National Heroes Day. 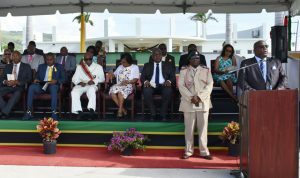 Basseterre, St. Kitts, 18th September, 2018 (MyVueNews.com) – Sixteen citizens will be officially honoured later this year after being named by Prime Minister Dr. Timothy Harris during the 16th September National Heroes commemoration at the new National Heroes Park at Conaree. The names were released just two days before the country holds its 35th Anniversary of Independence Parade under the theme, ‘Love, Service, Patriotism and Pride: Independence 35’. To receive the Companion of Star of Merit are Alphonso Barker, Business Entrepreneurship/Culture; Kenneth Kelly, Business Entrepreneurship; Alphonso Bridgewater, Sports Administration/Public Service; Creighton Pencheon, Culture; J. Calvin Fahie, Policing/Community Service; Elston “Ellie Matt” Nero, Musical Excellence Locally, Regionally and Internationally; Sylvine Henry, Public Service/Community Service; Hilton Clarke, Education/Community Service, Adrian Lam, Musical Production/Community Service; and Ambassador His Excellency Sydney Osborne, Education/Public Service. 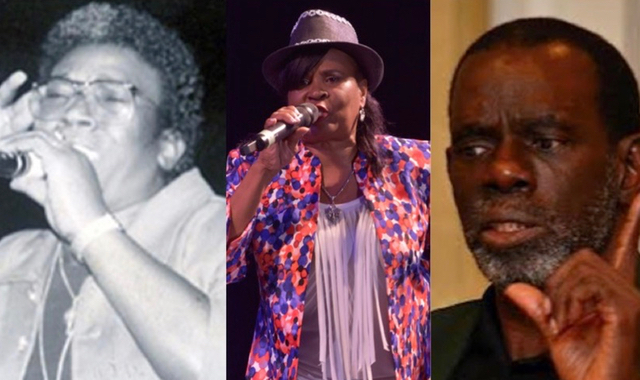 Medal of Honour recipients will be Ellenita Nathaniel, Education/Community Service; Sylvester Hodge (King Socrates), Calypso/Music; Walston Shield (King Starshield), Calypso/Music; Jacqueline Leader (Singing Jackie), Calypso/Music; Errol Dolphin (King Arrow), Calypso/Music; and Lionel Gumbs (Mansion Bull), Culture. Top Photo: King Ellie Matt, Singing Jackie and Alphonso ‘Bridges’ Bridgewater are among the 16 citizens named to receive national honours later this year.